Whale Sacs are handmade by Tina Stanaitis, based out of Portland, OR. Check out her Blog HERE! The beginning of Whale Sacs came about in her first year of playing disc golf in Wisconsin where the summers are hot and humid. Tina has many hobbies including Disc Golf, Sewing, music, bowling, and many others, which led to the creation of the Whale Sac that exists today. Originally the Whale Sac was simply a square pouch with whale themed fabric, but over time it transformed into this Whale shaped, tie-on sac. Tina is a touring Professional Disc Golfer, and plans to spread these happy whales around the country in the process. To follow the tour visit the WhalePants facebook page! Years ago Tina started what was called the “Whale Club”. She would help mend her friend’s clothes by patching them up but only using whale fabric. There were only a few handfuls of people in the whale club in the beginning. Once Tina began disc golfing in the hot and humid summers of the midwest, she decided to make her own hand drying bags with this same whale fabric, and so the first “Whale Sac” was born. Initially this was simply a square filled with clay, and eventually there was also a piece added to tie it onto her disc golf bag. In the summer of 2014 during the 2014 Worlds Disc Golf Championship in Portland, OR, an idea was born to make the sacs into the shape of an actual whale using the tail to tie on. Now there are countless members of the Whale Club especially in the Pacific Northwest but hopefully soon to be the rest of the country and eventually the world! 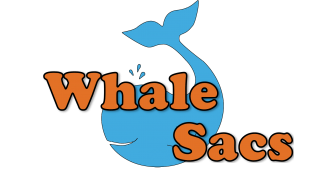 The Whale Sacs logo was designed by friend and fellow disc golfer Madeline Okrent. Madeline has also designed logos for other companies and creates commissioned art upon request. We want all of our customers to be satisfied! Sometimes with “misuse” or accidents a Whale Sac can tear, if this happens to you, reach out to us via email or Facebook and we will replace it on a case by case basis. The most common accident is pulling down on the whale body while attempting to tighten the knot once tied on, be cautious to pull only on the tail to tighten your Whale Sac onto your bag!